How do you install a 4 barrel carburetor in a 1975 Mustang Ghia? I'm assuming that you are starting with a stock 2 barrel carburetor on a 302 cubic inch ( 5.0 liter ) engine. Basically, you have two ways to go, to add a 4 barrel intake manifold, linkage and new carburetor. Your choices are to install a stock 5.0 intake manifold, linkage and carburetor, which would make the setup very simple, or you could go with aftermarket parts. The latter is almost as easy to install, but will produce considerably more power, particularly if you intend to also install headers and a freer flowing dual exhaust system. Probably the simplest solution is to get yourself a complete intake, carb and linkage from a 1971-1973 Mustang 302. The engine is the same, so the only fabrication, may be the gas pedal linkage. Fortunately, this swap has been done countless times over the past several decades, so it's easy to get a good 1975 Mustang 4 barrel carburetor setup, for your car. 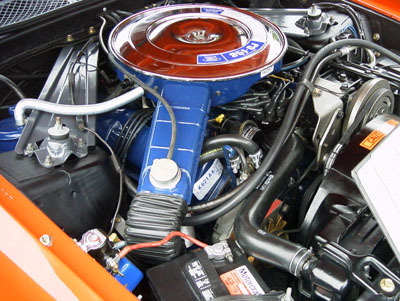 The aftermarket companies, such as Edelbrock, supply linkage kits to adapt your throttle linkage to the new carburetor. The following is a general guide to installing your new intake manifold and new or used 1975 Mustang 4 barrel carburetor. Hopefully that's enough to get you moving in the right direction. For more details, I'd suggest you look at picking up something like a Ford Performance Book, that covers aftermarket performance parts installations.